Fresh from their medal winning performances in Rio, members of the British Sailing Team will help celebrate the start of this year’s Southampton Boat Show. Visitors will be able to get up close to the sailing stars at the Show’s official opening ceremony on Friday 16 September. Gold Medalists: Giles Scott (Men’s Finn), Hannah Mills and Saskia Clark (470 Dinghy) and Silver Medalist: Nick Dempsey (Men’s RS:X windsurfer) will be joined by a number of other proud sailors fresh from their inspiring performances in Rio. Visitors to the Show can experience the thrill of being out on the water with the hugely popular Try-a-Boat feature. Whether you’re a beginner or a sailing veteran, choose from a varied selection of the latest RIBs, powerboats and yachts and enjoy getting out on the water for FREE. This attraction is in great demand so get to the Show early as it is first come, first served. Book your Try-a-Boat session as soon as you enter the Show, in the Arena on stand A140. Try-a-Boat is available for children aged 8 upwards but under 18s need a signature from an adult. Disabled members of the public can also enjoy a trip on the water with Wetwheels a fully wheelchair accessible, 9m Cheetah catamaran powered by two of Suzuki’s flagship V6 300hp outboard engines. Wetwheels which was built on the Isle of Wight has access via a side-opening door and ramp onto her large open deck. She is MCA coded (category 2) to take up to 10 passengers and Wetwheels has three wheelchair tie-down positions on the deck for maximum safety. On The Water invites 8-16 year olds to discover the excitement of dinghy sailing and Stand Up Paddleboarding with Get Afloat. Supported by the team from Rockley, this activity lasts about an hour and is a great opportunity to have a go at sailing and Stand Up Paddleboarding for FREE. 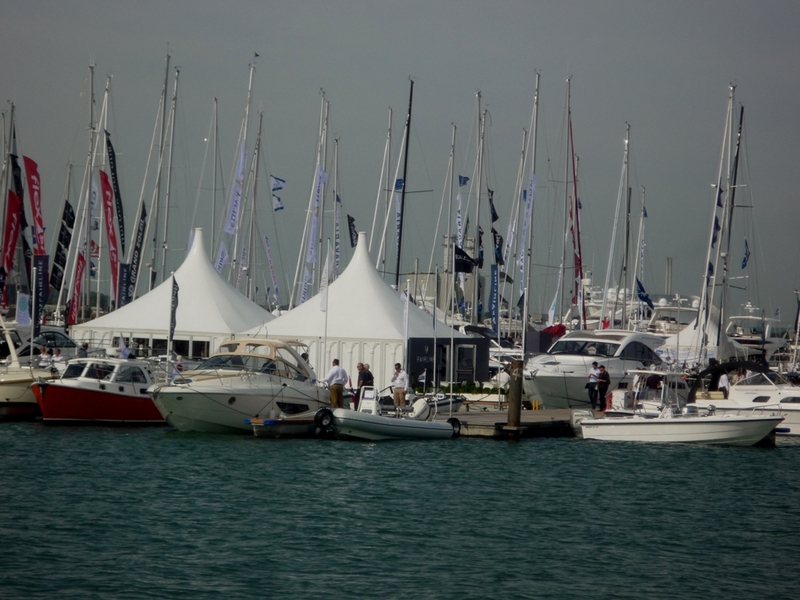 One of the main features of the show is one of Europe’s largest purpose built marinas, this year supported by KUBE. With over 2km of pontoons, which display more than 300 boats, some showcasing debuts and world launches, there is certainly something for everyone. Tall Ship Artemis will be berthed on the Marina, and available for visitors to climb on board, discover and learn more about her history, and chat to her crew. Launched in 1926 in Norway, Artemis was one of the most imposing three-masted sailing barques of her time. Conversion to a cargo freighter in the 1950s resulted in the loss of her masts and installation of a new modern engine, but she was an efficient vessel and for over 25 years plied her trade between Asia, South America and Europe. See her on the Marina every day of the Show 16 – 25 September. There will be the chance to meet members from ‘Team Britannia’ a multi-million pound British bid to design and build the fastest and most fuel efficient semi wave-slicing powerboat to circumnavigate the globe for the much coveted UIM world record currently held by the New Zealander Pete Bethune at 60 days 23 hours 49 minutes. There have only ever been three record attempts, prior to ‘Team Britannia’. The first, ‘Cable & Wireless Adventurer’ set the world record in 1998, the second, ‘Spirit of Cardiff’ ended in failure in 2002 after a medical emergency and finally Pete Bethune, the current record holder ,with his record set in 2008, in a boat called ‘Earthrace’. ‘Team Britannia’ will have massive fuel tanks which will enable the team of 12 skippered by Alan Priddy, to complete the seven 3,800 mile legs of the voyage when they will try to break the existing record. ‘Team Britannia’ will be launched at Southampton Boat Show and will then commence two weeks of sea trials, before sailing to London and then on to the Monaco Yacht Show. After Monaco the boat will travel to Gibraltar, for a final programme of sea trials before being stripped of any non-essential items including the toilet! Finally on 23 October 2016 Team Britannia will set off on the round the world record attempt. To complete the record attempt the boat must pass through the Suez and Panama Canals, cross the Tropic of Cancer and the Equator and start and finish in the same place. The world record authorities, UIM (Union Internationale Motonautique) have approved the proposed route for ‘Team Britannia’ which will start in Gibraltar and call at Puerto Rico, Manzanillo, Honolulu, Guam, Singapore, Oman and Malta. (don’t miss The Raiders on Saturday 17 September and Sunday 18 September at 2pm), The Festival Stage the place to see top bands, cooking demonstrations, fashion shows and be part of the Show’s Guinness World Record attempt to create a picture of a boat using people. For those who like the traditional, members from the Wooden Boatbuilders’ Trade Association (WBTA) are at this year’s Show, presenting a wide variety of boats. Their display will cover all types of craft and most methods of construction and provide a stunning backdrop as you enter the show. Amongst Isle of Wight companies at the show are BVD Marine makers of Seaspray dories, Coastworker workboats and Microboat tenders which are double-skinned, unsinkable and incredibly stable performance tenders which can go at planing speeds when fitted with 4hp or 5hp motors. Find them stands AO81/82. 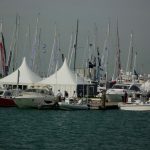 On Stand EO42 there will be information from Dean & Reddyhoff Marinas which have four bases on the South Coast-Portland,Weymouth, Haslar, Portsmouth and East Cowes IW and over 20 years experience in marina operating. Their East Cowes, Marina is positioned on the River Medina with easy access to the rest of the Island. Queen Victoria’s home at Osborne House is minutes away. The show held in Mayflower Park and Town Quay Southampton as well as on the water near the park is open from 16th September until 25th September. One of the show entrances is next to the Red Funnel terminal in Southampton.